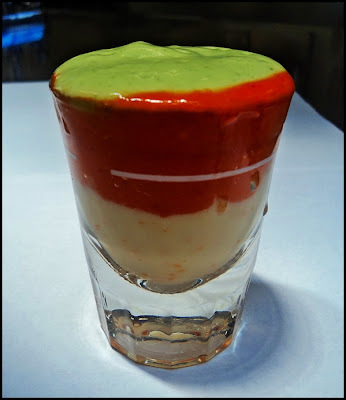 Tonight we'll serve these gazpacho shooters as a component of a cocktail party menu...pureed gazpacho made from perfectly ripe red and yellow tomatoes topped with yogurt and green onion puree. Easy to make, delicious, nutritious...and pleasing to look at. There's a basic gazpacho recipe below (omit the breadcrumbs to puree it smooth) but if you'd like additional recipes or to read about cold soups and the stories behind them, read this article that I wrote for Artvoice a little while ago (the carrot vichyssoise recipe--included in the article--would be a delicious layer in the as well). Combine all of the ingredients in a blender and pulse until desired consistency. Let stand 10 minutes; served chilled or at room temperature. Optional garnishes include but are not limited to: diced raw onion, hard cooked egg, parsley, and olives.